The British Gazette » Korea: A game of “chicken” – played with thermonuclear weapons. This is the second article today. What is not only depressing, but VERY seriously worrying is that IF our civil servants and government minsters cannot deal with simple, easy issues such as Mr Ridge, WHAT HOPE have we when these people are presented with SERIOUS ISSUES! 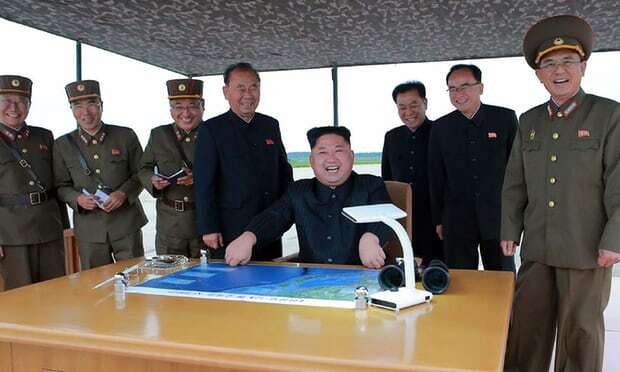 In yesterday’s article (http://www.british-gazette.co.uk/2017/08/29/north-korea-mistaking-weakness-for-strength/) we explained how Mr Kim finds himself tied into an ever escalating ratchet mechanism of always, “upping the ante” with such as Mr Trump. This is because Mr Kim must always be seen to have the last word, to be seen as the master of the game. This is because if Mr Kim is seen to be defeated by Mr Trump his position at the top will be compromised and the knives – quite literally in this case – will be out! 1. Mr Kim cannot and will not abandon his nuclear weapons programme. A. Accept that North Korea will eventually develop and deploy ICBMs capable of striking cities in the continental USA (south and east of Alaska) as well as across Japan and Korea. B. Remove these missiles and the capacity to launch same militarily. NB: Option B. is only possible with such as the LGM-30G Minuteman III ICBM. Below: God help us. I fear the only option is to remove the capability before he can actually get live missiles to do the distance. Trump will be accused of being a mad man but that is not so and he deserves support. Negotiations get nowhere with “Kim”; he has shown he cannot be trusted. Destroy his capability before it is too late. He has threatened the USA and Japan.